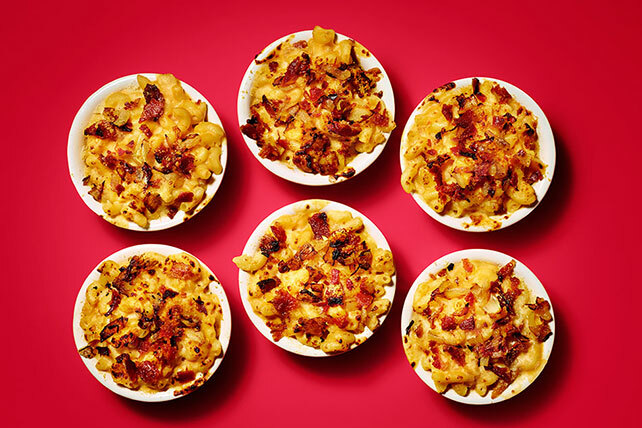 Treat them to real homemade mac and cheese with the Baked Mac and Cheese with Bacon recipe. Our Baked Mac and Cheese with Bacon is ready in 45 minutes. Cook macaroni as directed on package, omitting salt. Meanwhile, melt butter in large saucepan on medium heat. Add onions; cook and stir 2 min. or until golden brown. Stir in flour; cook 2 min., stirring constantly. Whisk in milk, then dressing. Bring just to simmer, stirring constantly; cook and stir 2 to 3 min. or until thickened. Add cheeses and Sriracha sauce; cook and stir 2 min. or until cheddar is melted. Drain macaroni. Add to prepared cheese sauce along with the bacon; mix lightly. Spoon into in 13x9-inch baking dish sprayed with cooking spray. Serve this main dish with crunchy, raw vegetables and your favorite fresh fruit to round out the meal. Stir in 3 cups fresh spinach before serving.